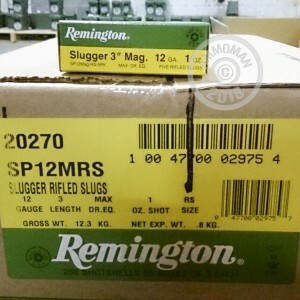 Show the deer who's boss with this one ounce slug from Remington. These 12 gauge, 2-3/4" shells for smoothbore shotguns use a magnum load that achieves a muzzle velocity of 1,760 feet per second. Combine that with the mass of the projectile and you have a round that will easily outperform buckshot and rifle rounds at 100 yards. While not as precise as a .308 round fired from a scoped rifle, this slug is no slouch when it comes to accuracy. The rifling on the slug provides stability, which synergizes with the flat, high-velocity trajectory to get your shot on target. This 250 shell case can go a long way if you're good with your boomstick. Buy it (or any other items over $99) to get FREE shipping from AmmoMan.com.